JoAnne Worley to receive inaugural 'Friend for Life' Award . 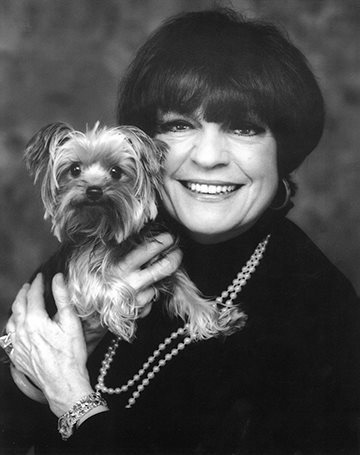 JoAnne Worley and her rescue dog Harmony. Palm Springs, CA – September 14, 2015 - JoAnne Worley, actress, singer, and comedienne, will be honored with the Friends For Life Award at the Friends of the Palm Springs Animal Shelter’s annual gala, The Faux Fur Ball II: Puttin’ On The Leash on October 24, 2015. As president of Actors and Others for Animals, Worley is being honored for her years of dedication to improving the lives of animals. Faux Fur Ball II: Puttin’ On The Leash will be held from 5:30-9:00pm on October 24, 2015, at the Palm Springs Animal Shelter. Over 300 guests are expected to attend the event, which will feature cocktails, hors d’oeuvres, dinner, dancing, a live auction, and many four-legged guests as well. Tickets are available online at www.psanimalshelter.org. Friends of the Palm Springs Animal Shelter is dedicated to responsible pet stewardship and humane treatment of animals. In 2012, the non-profit organization entered into a unique public/private agreement with the City of Palm Springs, who appointed Friends responsible for the management and operation of the city’s animal shelter. Because of this partnership, the Palm Springs Animal Shelter is the only municipal shelter in the Coachella Valley operating under a no-kill philosophy.